The cluster has an apparent magnitude of 5.9 and lies at an approximate distance of 3,200 light years from Earth. It has the designation NGC 2323 in the New General Catalogue. 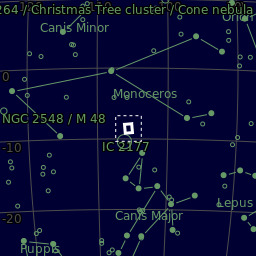 Messier 50 lies to the east of Orion, near the border between Monoceros and Canis Major constellation. It occupies an area about half the size of the full Moon and is relatively easy to find because it is located 9.5 degrees north-northeast of Sirius, the brightest star in the sky. M50 can be found about 20 degrees along the line formed by the three bright stars of Orion’s Belt. It can be found about two fifths of the way from Sirius to Procyon, the brightest star in Canis Minor constellation and eighth brightest star in the sky. A delicate and close double star in a cluster of the Via Lactea [Milky Way], on the Unicorn‘s right shoulder. A [mag] 8 and B 13, both pale white. This is an irregularly round and very rich mass, occupying with its numerous outliers more than the field, and composed of stars from the 8th to the 16th magnitudes; and there are certain spots of splendour which indicate minute masses beyond the power of my telescope. The most decided points are, a red star towards the southern verge, and a pretty little equilateral triangle of 10th magnitude stars, just below, or north of it. This superb object was discovered by Messier in 1771 [actually 1772], and registered “a mass of small stars more or less brilliant.” It is 9deg north-north-east of Sirius, and rather more than one-third of the distance between that star and Procyon. A small reflection nebula,VdB 87a, is visible at the lower right corner of the frame.